Burning off time, not price. Still waiting for a dip to 425 or so. Question... What is an awful bottom call for GG? 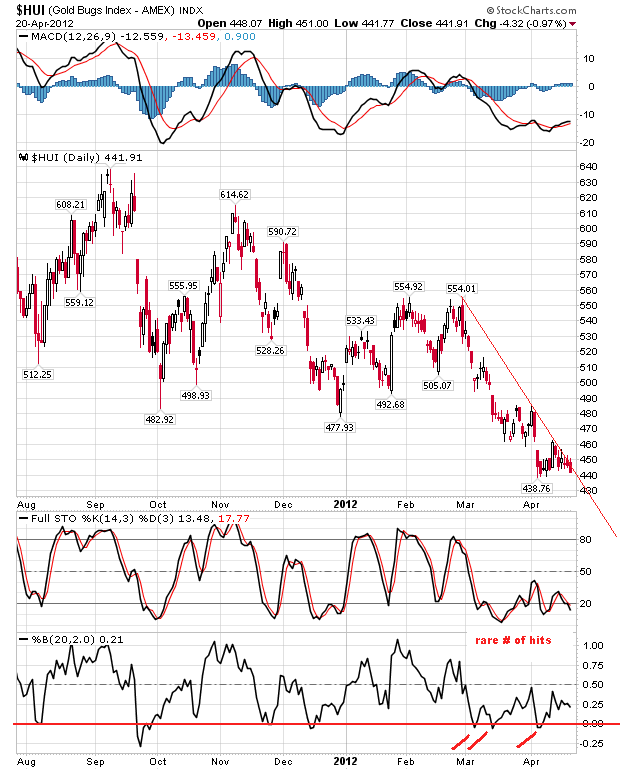 HUI has gone from traveling sideways to breaking down below $480 to confirm a rounding tops formation. Now the correction begins but you have to find a bottom first. 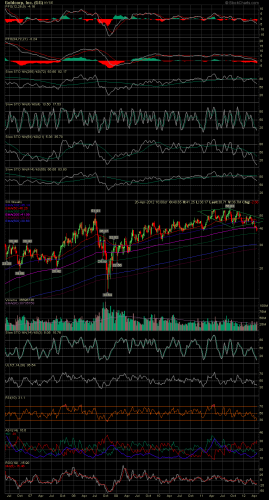 Strong long term supports at the $400 and $380 areas. Extreme long term bottoms line from 2001 hits around $275. I would think the $400 or $380 levels would hold since drawing a long term line near those levels from 2001 would be a good rate of ascent in a long term bull. Another 'backup the truck' moment if you have any cash left. Even being lucky with one or two long shots, doesn't help now if holding a large portfolio. Even trying to trade the miners is tough without price swings. Watch silver, still hasn't crashed $30. Don't know if it will. Only Norcini has mentioned lower targets if $30 gives way. 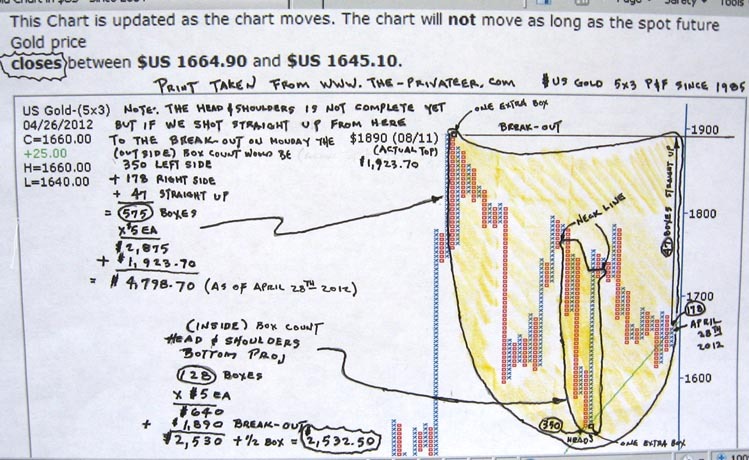 Armstrong charges $300 now for his gold predictions but the gold action is definitely following his patterns that is/was contrary to most typical thinking. I wonder when investors figure out gold comes from the ground and not from paper trades? Revenues increased 11% to $1.3 billion on gold sales of 545,700 ounces. Operating cash flow before working capital changes increased 4% to $480 million or $0.59 per share. Adjusted net earnings increased 3% over the 2011 first quarter, to $404 million or $0.50 per share. Cash costs totaled $251 per ounce on a by-product basis and $648 per ounce on a co-product basis. Dividends paid amounted to $109 million. Quarter-end cash balance of $1.4 billion; net cash position of $0.5 billion4. High Pressure Grinding Roll ("HPGR") supplemental feed system commissioned at Peñasquito. Is it time yet? Looks like someone didn't want to hold their shorts much long in AEM today. I think gold is an asset class at a bubble valuation that should be currently avoided. Personally, I sold mine last summer. The following graph courtesy of Goldprice.org says it all. Gold was an attractive investment in the late 1990's to early 2000's, but it is clearly at extremely high levels now. Therefore, I would suggest taking some (or even all) profits. As I have written before, I feel that fixed income (bonds, etc.) 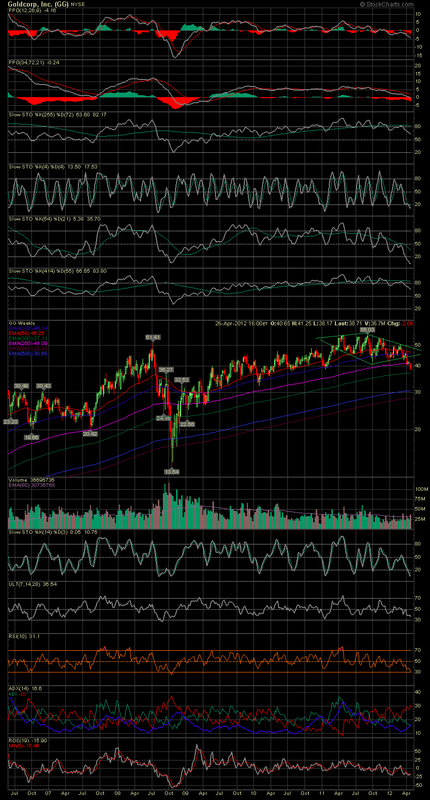 is also at an extreme, and therefore, I temporarily also favor avoiding this asset class. I feel that asset classes should only be used for diversification when they are prudent and sound. To force money into a dangerous investment solely for an artificial commitment to diversification makes no sense to me. Divide by money supply/ debt if you want a dollar relative value. Otherwise you are just showing how screwed up the money supply/ debt is. Price of gold has no relation to confetti production; if that was the case then Gold would be over 15k. “There are no bond vigilantes to come after the USA for fear of solvency. There is simply no such thing. The only form of insolvency the USA faces is in the form of hyperinflation and that is a very different phenomenon than the one we currently are at risk of. 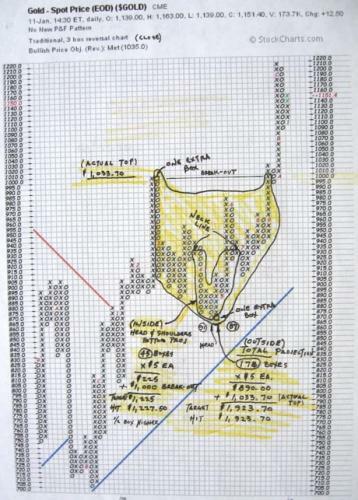 Bond traders in the USA get this. If there is one axiom that holds true in U.S. government bond markets it is “Don’t fight the Fed”. I doubt that all US government bond traders understand the idea that there is no solvency issue at the US Federal level, but they do understand that the Fed essentially controls the entire curve via short-term policy moves. They know it because they’ve watched men like Niall Ferguson, (who has been ranting about surging US government bond yields for almost an entire decade) make this mistake based on faulty analysis. Note: With the caveat that I have no expertise in point and figure chart reading and all I have done is observed these charts and saw that they seem to work giving projections. I thought I would post them to share with the board these observations. 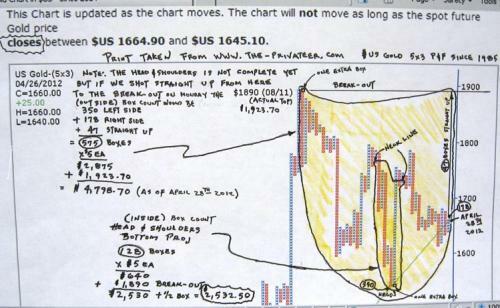 The first chart taken from Stock Charts.com ($gold) traditional 3 box reversal (close) dated 1-11-2010. (A) Using the box count for the head and shoulders bottom portion was 45 boxes x $5.00 each = $225 add to the breakout of $1000 = $1225 it hit $1227.50 one half box more. ( If you count all the boxes from the breakout down to the head adding one box when you start down from the top left side then add one box starting up the right side by the head the total comes to 178 boxes x $5.00 each =$890.00 to this you add the actual breakout high of $1033.70 which equals $1923.70 it hit $1923.70. Let see where we are now in gold. April 28, 2012. 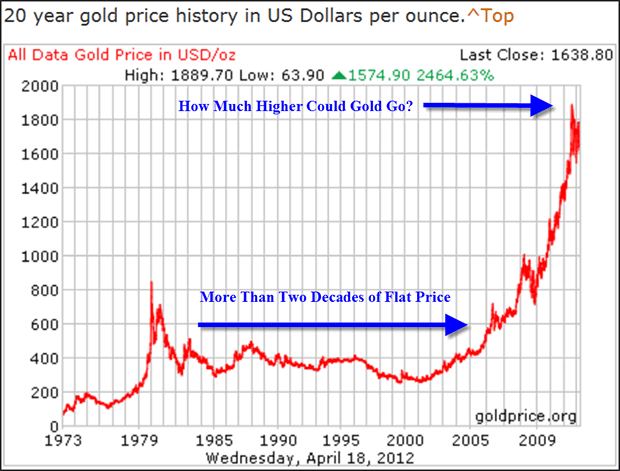 In the second chart taken from the privateer.com $usgold 5 x 3 p&f since 1985. ( The outside box projection as a minimum today already projects to $4798.70 so as we add more boxes on our way up to the breakout the projection will be even higher. The reason I use two different charting services for the example is because they are both in $5.00 increments. This assumes that it continues in the head and shoulders pattern and it does what it did before. I also have worked the charts from the $250 start of the bull to $733.40 and $733.40 to $1033.40 if anyone is interested in seeing them.